Unless you’ve been living under a rock, you probably know whats going on in the music world—starting with Kpop, and how big it has become. For the last few years, Kpop made its way into U.S. mainstream music—with bands like EXO and BTS making it to the billboard 100 between 2015 – 2017. It is a huge deal for Kpop fans and the Kpop music industry, but also something new and interesting for Americans to watch and learn. American performers are taught to sing and dance, but not do it at the same time; either they sing, or they dance and they lip sing because their bodies aren’t trained to do it. In the K-pop industry, there is no such thing as doing one or the other; artists are taught to sing and dance simultaneously and are trained for years prior to fame. BTS and EXO are Kpop music groups that have been working tirelessly for the last 10years of their life, maybe even longer. EXO is a K-pop group that originally started off with 12 members and had subdivision units because the group was so big. The group is now left with 9 members because 3 people left the group. The group members are Suho, Xiumin, Lau, BaeKhyun, Chen, Chanyeol, D.O. Kai, and Sehun. Former members are Kris, Tao, and Luhan. Exo debuted on April 8, 2012, and worked for years before they were signed under S.M. entertainment. BTS is a Kpop boy band consisted of seven members. Rap Monster, Jin, Jimin, JungKook, Jhope, V, and Suga. Earlier on this year, BTS was the first K-POP group to ever win a Billboard music award, and that was the hot topic in the music industry majority of the 2017 spring season. The category they were under was Top Social Artist, and they beat out wonderful well-known artists like Selena Gomez, Justin Bieber, Shawn Mendez and much more! BTS A.R.M.Y voted 300 Million times and billboard music awards allowed the votes to be internationally under this category and they won by a landslide! After the awards, they started earning more recognition by American artists and have been working with them since. The leader Rap Monster worked with artist Wale on a song called “Change” about how much change needed to be done in the U.S. and South Korea. Since then, they did a U.S. Stadium tour each city two nights and they sold out all nights of all the stadiums they performed at, and are set to tour again in the summer and fall of 2018. selling out stadium tours has never been done by another Kpop group. Recently, U.S. Kpop fans have been trying to get both groups nominated for the upcoming award shows next year since both groups just released new music videos and both have brand new albums out. The awards K-pop fans are striving for are the VMAs, BBMAs, AAMAs, Grammys, and vh1. With Korean music making its way into U.S. pop culture, this could be possible for both groups and hopefully solo artist as well. 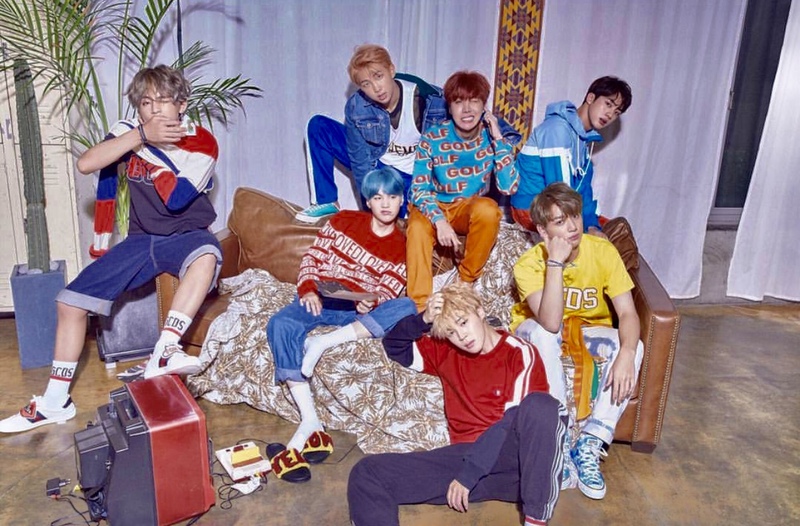 The K-pop fan base is up against a real award war, BTS started the battle, but which K-pop group is next to join forces and start chasing after the American music awards?